This is the first time that Specimen Illustrations has hit our radar but after seeing this lovely image, we are sure it won’t be our last time writing about them. On their FACEBOOK PAGE they describe themselves as “The hyperdetailed illustrations of a positively obsessive evolutionary biologist.” That biologist / artist is Jennifer Joslin and we have fallen in love with her latest piece. 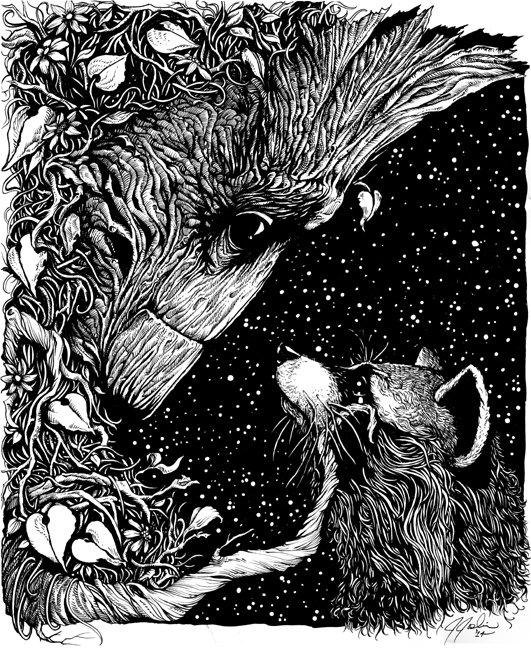 Jennifer Joslin is a self-taught, freelance illustrator based in the Portland metro area of Oregon. She lives in a bright, cozy basement apartment among the rain and the trees. Jenn is nearing the completion of a degree in Biology with a focus on evolution and genetics at Portland State University and studies evolutionary biology on her own voraciously. She uses her constantly-developing knowledge of both science and art to create highly detailed illustrations that focus on the connectedness and resilience of life. Jennifer has taken two of the main characters from Marvel’s mega-hit film, Guardians of the Galaxy, and created a touching tribute to the enduring friendship displayed in the film. Here is what she has to say about the print over in her OFFICIAL SHOP. Letterpress, limited edition of 50, 11.75″ x 14″. Marvel’s newest film Guardians of the Galaxy won my heart this summer. It’s their best film to date in my humble opinion and this scene is the best in the film. Heartwarming, heartbreaking, and an instant classic. This image is very loosely based off of the characters in that film. 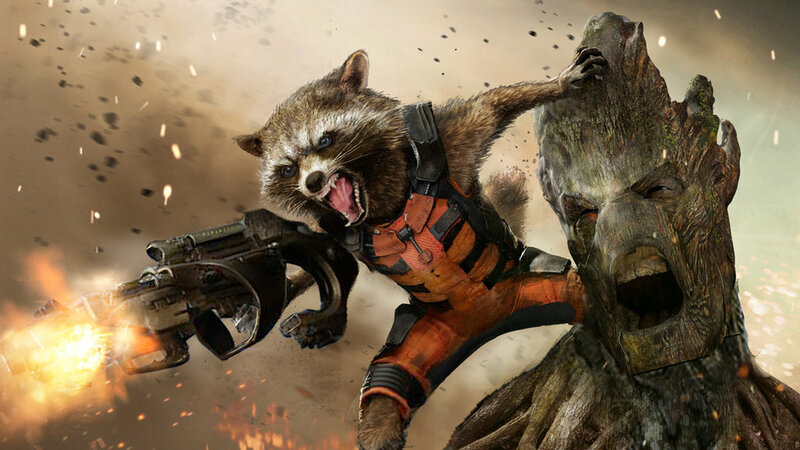 Marvel Entertainment owns all rights to the characters of Groot and Rocket Raccoon. They are in NO way associated with me whatsoever. I’m just one of millions of lowly illustrators getting her fan art on. “Groot & Rocket” was originally drawn with archival ink on smooth vellum bristol. These letterpress prints were produced by Katy over at KeeganMeegan & Co. in Portland, Oregon during the month of February 2015. Original piece in the collection of Ron G.
All prints are numbered and signed by the artist and come with their own unique Certificate of Authenticity. Head on over to Specimen Illustration to get your “Groot & Rocket” letterpress print before they are gone. Also, let Jennifer know about your favorite pizza place while you are at it. She is a self proclaimed pizza enthusiast. Personally, I hear that Apizza Scholls is pretty spectacular. 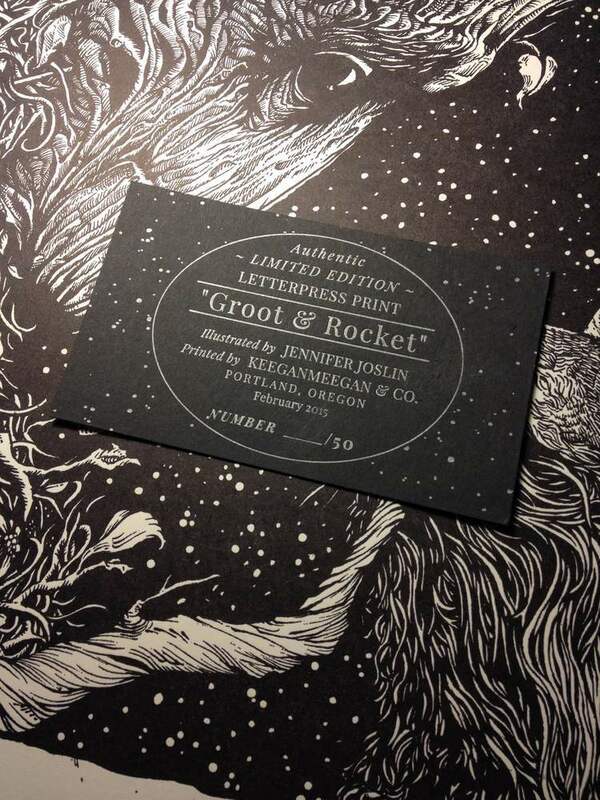 This entry was posted in Art, Marvel, Movies, Posters, Science Fiction and tagged Groot, Groot & Rocket, Guardians Of The Galaxy, Jennifer Joslin, letterpress print, Limited edition, Marvel, Rocket, Specimen Illustrations. Bookmark the permalink.